We are Team Peruagus. We aim to design and build the first autonomous vessel capable of crossing the Atlantic within the regulations set by the Microtransat Challenge (May 2017). The Microtransat Challenge is attempted by several teams every year and has so far not been finished successfully. We aim to change that. 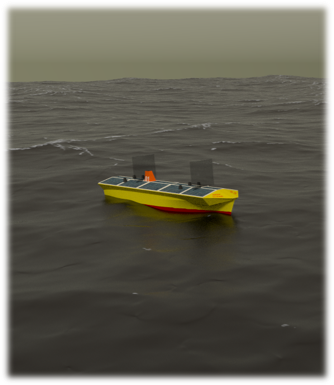 Since “the race aims to stimulate the development of autonomous boats through friendly competition”, all attempts are documented thoroughly. We are designing and manufacturing an autonomous vessel capable of crossing the Atlantic under the regulations of the Microtransat Challenge as our Group Design Project. The challenge has never been completed, with all previous vessels failing for a variety of reasons. We are carefully analysing the attempts of each previous team, as well as selecting the optimum route, to ensure that our vessel succeeds where all others have failed. We will be designing and building a vessel from the ground up, with each system carefully selected to be both effective and resilient to the conditions it will face in the Atlantic. We chose this project because it is an epic engineering challenge. Designing an autonomous vessel of this scale - less than 2.4 meters long and capable of withstanding the worst the Atlantic has to offer, all whilst running purely on renewable energy - is a true test of our engineering ability! If we were to be successful it would be a triumph for both renewable energy and affordable autonomous systems (compared to current commercially available systems). We would be proving that renewable energy is capable of powering systems in the worlds harshest environments. These vessels can be used to monitor climate change and weather patterns. Proving that effective autonomous systems can be affordable will help to drive their development, resulting in more vessels, more measurements and more accurate predictions. Fitment of items allowing us to meet safety requirements, such as navigation lights and radar deflectors. The University has kindly offered to match fund £500 of this project, meaning that we will receive £2 for every £1 you donate. You don't need to give money to help us succeed! Please share this project with anyone you think would support us.